If you have sparse hair, dandruff problems or your hair does not seem as think the experts are saying that it might be due to a lack of Vitamin A. This is particularly true of women who are still smoking and are younger. Women who are overweight or have insulin resistance also don’t absorb enough Vitamin A and the result of this shows in the texture and the thickness of the hair and also the health of scalp. Does your hair suddenly seem a bit dry and brittle. Is it losing its color too? Having enough vitamin A in your diet is crucial as it is necessary for the production of sebum, the oily substance that is produced by the sebaceous glands that helps to keep your scalp at the proper moisture levels. It also helps your body produce the compounds it needs to prevent hair from losing its pigment and going gray or white. So before you get out the hair dye consider taking Vitamin A instead. A surplus of sebum creates a scalp clogged with oil. If you do not have enough then a dry flaking scalp is the result. Both situations indicate an imbalance that could be remedied by taking more Vitamin A. Blocked follicles cause hair to die and an overproduction of sebum due to a lack of vitamins causes issues. Vitamin A hair supplements are very easy to come by at your local drug store and work most effectively if you can take them it in the ACE form, which means that you are taking Vitamins A, C and E all at once. You can find some formulas that contain biotin and extra iron, which are also helpful for hair that is looking listless for nutritional reasons. Whenever possible you should try and get your hair vitamins from food and only resort to supplements if you really feel your body is not absorbing the nutrients properly. Foods that are rich in vitamin A include sweet potatoes, carrots, peaches, melon, oranges and mangoes. In fact, any time you feel that you are short on Vitamin A, eat a fruit or vegetable that is colored orange. The liquid formulas work best because your body absorbs the Vitamin A immediately. Pill forms are less effective as they have binders and fillers that make it hard for someone to absorb the vitamins fully. You can also get a formula that combines A, C and E that increases the effect of all three vitamins. Thanks to Madmen Season 5 the fashion industry and the general public are going for Madmen styles. A good example is the egg shaped low ponytail that was featured on the runways of designer Marc Jacobs. This was an egg shaped hairdo with a lift at the back but with very flat side-swept bangs on the front. The length of the hair is tied back into a ponytail. This is a look that looks great with heavier eyebrows and very white pale lips. The bouffant look was also translated to a shorter cut. The hair is teased on the crown with whispy bangs in the front. A hairband is tied from the back of the ears and up to the crown to make a bow. The hairband used should have a demure flattened bow and pick up a color theme in the blouse or shirt you are wearing. If you want to go for a Kitten With a Whip look then you can do what designer Moschino did and bouffant your hair up and tie it into a half-pony. Make sure that is parted on the side. Make sure you have heavier brows and heavy mascara to go with this look if you want to look a great deal like Ann Margaret. This look is also similar to the half-up Brigitte Bardot hair style in which a the hair is parted in the center and the bouffant is at the top. Simplest of all of these looks is the 1960s ponytail which is made with a bouffant at the top with the tail of hair pulled tightly at the nape of the neck. As hard as it is to maintain it seems that the classic Holly Go Lightly beehive will never go our of style. Volume and style is given to this look by twisting the hair on top of the head. Oscar De La Renta livened up the bouffant by adding a very bright streak of magenta pink color into a blonde do. These looks are very easy to achieve with a bit of back brushing to give the crown the lift it needs to look fashionable. Nowadays you can buy root lift products that are much easier and nicer to use than the aerosol hair spray products that women from the fifties used to raise the height of their hair into a sky-high bouffants. These root-lift products that are made by most major companies like Bedhead and L’Oreal are also easier on the environment. Click here to buy hair products. It has been known for decades that chemical straightness and relaxants is bad for your hair and can cause baldness loss. Still that is not going to prevent women from straightening their hair to get that glossy, fashionable look. If you must use chemical relaxants and straighteners to look your best here are some tips for conducting the process so that you can protect your health and hair. Tip #1 – Avoid products with lye in it. Lye, is in effect, a dangerous poison that causes burns and cancer. Lye also causes the kind of dermatitis that leads to permanent hair loss. It also has the long term effect of lowering your immune system. Tip #3 – Always apply a protective layer of petroleum based jelly or cream to the scalp to prevent the hair solution fro touching your scalp. This prevents it from burning or absorbing chemicals that could cause hair loss or balding. Tip #4 – You can avoid losing your hair by making sure that you complete rinse your hair with warm water after the relaxer chemical has been applied and allowed to set in your hair for the prescribed time. This is crucial or your hair can break off in mid-strnd. Tip #6 – Quickly and efficiently remove all of the hair relaxant from the hair with water once it’s “time is up” to prevent damage and burning to hair and the scalp. It is a good idea to use a Color Indicator shampoo which turns a certain color to tell you when the entire product has been rinsed out of the hair. Tip #7 – To make sure that you do not burn yourself or your hair consider getting any type of hair straightening procedure done professionally. It is hard for what you are doing. If you can’t afford to get it done by a salon professional then ask a friend to help you. A second eye monitoring the process can help prevent any further damage from being done. It is crucial that the person applying the chemicals should also wear gloves, a smock and protective clothing so that he or she is also not affected and at risk of contracting cancer or hair loss. DermOrganic Leave-In Treatment is based on Moroccan Argan Fruit Oil, has the unique lightweight formula that is easily absorbed by hair without weighing it down. It restores shine and softness while strengthening brittle hair. This treatment replenishes nourishment to dry, damaged, and color treated hair and protects hair from heat caused by styling and UV damage. Restores shine and softness to dry, damaged, and colored treated hair. This treatment also has the unique property of speeding up blow dry time by up to 30%! The heat from the blow dryer makes the treatment more viscous, allowing it to penetrate into the hair, displacing water trapped under the cuticle and allowing your blow dryer to finish the hair quickly. 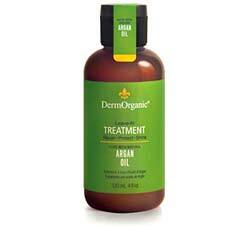 Unlike other Argan Oil based Treatments, DermOrganic contains no alcohol, no dyes, and no artificial preservatives.